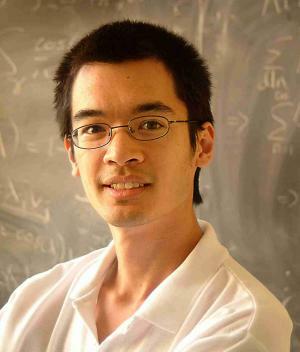 It was a warm Indian summer evening on the UCLA campus last Saturday night (October 9), and the feeling surrounding Schoenberg Hall was electric with anticipation for the “Einstein Lecture” by Fields Medalist Professor Terence Tao of UCLA. I arrived early to absorb the ambiance, and I wasn’t disappointed – it was fascinating to see such widespread interest in mathematics. The weekend saw mathematicians from far-off locations converge on the Math Sciences building for the regional meeting of the American Mathematical Society (AMS). The free public lecture that was scheduled for the evening hours not only attracted the mathematicians on-hand from the conference, but also people from many other walks of life, including seniors and children. As I sat reading a recent arXiv paper on modified gravity and gravitational waves, I surveyed the venue. There was a large area where serving tables were set up, alongside several large round tables designated for enjoying the food and drinks at the reception after the lecture. Not surprisingly, many of the attendees arrived early because the seating was first-come-first-served. A department insider told me that 1,000 people RSVP’d, but the lecture hall only seats 500. The organizers reserved a second hall for 200 more guests, and anyone else would have to watch the lecture on a large projection unit set up outside on the patio. As I sat soaking in the color, I noticed the guest of honor – Professor Tao, arrive dressed in a formal black suit. This was making out to be quite an affair – imagine that, mathematics on a Saturday night! The name of the lecture was “The Cosmic Distance Ladder.” Even though Professor Tao is a world renowned expert in research mathematics, his talk for the evening was concerning astrophysics. Rarely overviewed all at once, Tao led us through man’s journey in determining his place in the university. How do we know the distances from the earth to the sun and moon, from the sun to the other planets, and from the sun to other stars and distant galaxies? Clearly we can’t measure them directly. Nevertheless there are many ingenious indirect methods of measurement, combined with basic mathematics, which can give quite convincing and accurate results without the need for advanced technology. Even the Greeks could compute the distances from the earth to the sun and moon to moderate accuracy. Tao’s talk focused on these methods that rely on climbing a “cosmic distance ladder,” using measurements of nearby distances to deduce estimates on distances slightly farther away. In the lecture, he discussed the current 9 “rungs” of this ladder. It was a fascinating lecture and a superb way to spend a Saturday night. I attended the lecture with two old friends from my undergrad days at the UCLA Mathematics Department. At the wonderfully catered reception that followed I had the opportunity to catch up with the past iteration of department chairman, Professor Christoph Thiele, and current chair Professor Sorin Popa. It was a night to remember for sure, under the stars and with the distinct scent of world-class mathematics in the air. I was there at the lecture too. Dr. Tao is amazing. I saw some kids too. It was a nice evening affair. Hope there are more.. I was there, traveling since Tijuana. It was a very good lecture.